Everyone loves a good car show. We lay out the best Mustang events around the country as well as highlight what events we are hosting. Featured are our annual events like Mustang Mayhem and the AmericanMuscle Car Show–the largest Mustang only car show in the world! AmericanMuscle.com to Sponsor 1000HP Ford GT ECTA Land Speed Record Attempt! 1000HP Ford GT ECTA Land Speed Record Attempt! Check out our exclusive Image Gallery here! AmericanMuscle (www.americanmuscle.com) is helping to sponsor an attempt at the ECTA Land Speed Record for a Production Supercharged vehicle with a Stock Bottom End which is currently at 186.853MPH from a standing mile. Attempting this feat will be the car’s 73 year old owner Robert Self. The attempt will be made April 5-6th, 2008 at the East Coast Timing Association (ECTA) in Maxton, North Carolina. On the ECTA’s 1mile x 30ft abandoned runway track, Robert is looking to hit a cool 200-210MPH in his Ford GT and have room to stop. A fully custom roll cage, Halon fire extinguishing system, and drag chute have been installed by S&W Racecars. All performance enhancements and custom SCT dynamometer tuning have been performed by Eric Swarr & his team at Swarr Auto Performance Center in Collegeville, Pennsylvania (www.swarrauto.com). In addition to the $15,000 Whipple Industries Supercharger upgrade, Robert has an additional $30,000 over the car’s $170,000 base price invested in performance and safety upgrades. AmericanMuscle.com will be setting Robert up with the proper tire setup for running speeds in excess of 200MPH in a 1000+ horsepower car, and also helping to promote the event. Back in July, AmericanMuscle.com donated 5% of every sale on one day to Homes for Our Troops. HFOT is an organization that assists returning servicemen and women that have been severely injured as they selflessly serve our country. The organization, working with donations of money, building materials and professional labor, ­coordinates the process of building a new home or adapting an existing home for handicapped accessibility. AmericanMuscle.com raised more than $2100 for Homes for Our Troops during the event. And Homes for Our Troops has been kind enough to keep us updated on ­where our donation was used. On October 10, 2007, Homes for Our Troops held a ground-breaking ceremony in Plymouth, MA, at the site where a new handicapped accessible house would be built for SGT Brian Fountaine of the US Army. SGT Fountaine, a 24-year-old tank commander from Dorchester, MA, lost both legs below the knee in June 2006, in Baghdad, Iraq, when an improvised explosive device (IED) exploded under the vehicle he was riding in. Fountaine was a member of the First Brigade Combat Team of the Fourth Infantry Division and was serving his second tour of duty — a tour he volunteered for. During his first deployment, his unit came under attack almost daily from mortars and rifle fire, but Brian still volunteered for dangerous missions. The risk of permanent injury or death was huge, but SGT Fountaine said, "I was a soldier. I expected…either a loss of limb or a loss of life." The explosion that detonated beneath the Humvee carrying SGT Fountaine was the fifth time that he had survived an IED. Though he survived, he knew this time would be different when he found himself in the dirt beside the truck, looking at his mangled feet and fractured legs. "I knew I would become some sort of an amputee," said Fountaine, massaging the stumps of his legs, amputated 10 inches below the knees. ”I won’t be able to feel the grass between my feet or the sand under my toes, but the important thing is I still have my life." SGT Fountaine still has his life, and is able to walk with the help of prosthetics, but he still needs to use his wheelchair when the prosthetics become too painful. Because of this, and because of his enormous sacrifice and his willingness to volunteer himself for the most dangerous missions, Homes for Our Troops is in the process of building SGT Fountaine and his family a wheelchair accessible house. This new home — scheduled to be completed in March, 2008 — will allow him to deal with the many challenges that come with living with prosthetics and adjusting to a new way of life. His n­ew home in Plymouth, MA allows him the independence he fought for, while still being close to his family in Dorchester, MA. The walls of SGT Brian Fountaine’s new home going up! We at AmericanMuscle.com are honored to have been able to contribute to both Homes for Our Troops and SGT Fountaine. We can think of no organization that deserves it more. AmericanMuscle was proud to host a charity event on Saturday, July 21st 2007 to raise money for Homes For Our Troops. With the help of our customers and all of our dedicated staff we were able to raise $2,126.33 for Homes For Our Troops. Homes For Our Troops is a non-profit organization that is dedicated to helping those people that give selflessly to their country and have returned home with serious disabilities and injuries. This organization is committed to assisting severely injured Servicemen and Women, and their immediate families, by raising donations of money, building materials, and professional labor to build a new home or adapt an existing home for handicapped accessibility. Besides raising more than $2,100 for Homes for our Troops, we also had a lot of Fun and Food for our employees and their families. The party started with a Delicious Pig Roast and enough hamburgers and hot dogs to feed a small army. For the employees and friends who were looking to settle their personal grudges, we had Sumo wrestling and Jousting. A number of employees took advantage of the jousting to challenge Steve, one of the owners of the company. Steve took on all challengers, with only one defeat. American Muscle also raffled off a number of prizes in order to raise money for Homes for our Troops. There was a brand new iPhone, a case of Duff energy drink, a case of Cocaine energy drink, and a pair of Phillies tickets. If that wasn’t enough, we had a Hot Dog Eating Contest. Using the Nathans Hot Dog eating contest rules we had 11 competitors, for a total of 54 hot dogs eaten! Eric Brooks took the gold, swallowing a hefty 12 veggie hot dogs and winning a brand new Char-Broil Grill. We want to thank everyone who participated! It was a great event, benefiting a great Charity! From AmericanMuscle.com & Homes For Our Troops, Thank You! AmericanMuscle.com: Proud Sponsor of Mustang Week 2007! AmericanMuscle.com is proud to announce that we have been added as a sponsor for the 5th Annual Mustang Week, the Largest Mustang and SVT gathering on the East Coast! This is our second year sponsoring the event and, just like last year, we have provided a set of wheels to be given away to one lucky ‘Stang owner during Mustang Week! 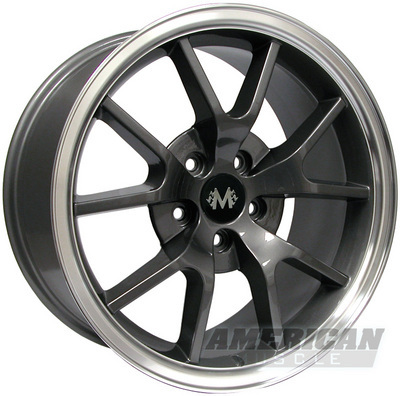 This year, we have sent a set of FOUR (4) 18×9 Anthracite FR500 wheels, worth more than $600! But, just in case you need more incentive to go to Myrtle Beach and show off your car, though, here is some information about the event! In 2002, Mustang Week began as a small cruise-in with roughly 150 ‘Stangs showing up to show off at Broadway at the Beach and The Hard Rock Café in Myrtle Beach, S.C.
By 2006, Mustang Week had grown into a 5-day festival packed with events that drew more than 700 Mustangs and SVT vehicles, along with thousands of spectators! Mustang Week is now one of the PREMIER Mustang events. In 2007, the staff and crew of Mustang Week has 5 days of events planned. Tuesday, July 24th is a Meet-N-Greet at Planet Hollywood from 4:30-8:30 p.m.
Wednesday, July 25th, the Mustang Week crew has planned Fun Runs and a Burn-Out Contest at the Myrtle Beach Speedway for all participants. Thursday, July 26th is Drag Night! Participants will meet at Hooters and cruise to Darlington Drag Strip. Friday is the 4th Annual Car Show at Colonial Mall, with the Mustang Week crew and judges presenting the Top 75 trophies and a whole lot of “Best of” Awards! Mustang Week wraps up on Saturday, July 28th, with the Southeast’s largest Mustang and SVT Cruise-In at Colonial Mall! Join the Mustang Week crew in Myrtle Beach, S.C. from July 23rdto July 29th, 2007 for the East Coast’s Largest Mustang and SVT gathering! Complete event and hotel details, as well as car show registration information, can be found on the event website: www.mustangweek.com, or by clicking the picture below! AmericanMuscle Rep Races Past the Competition! Spring is here and enthusiasts everywhere are bringing their ‘Stangs out of hibernation for racing season! One of AmericanMuscle.com’s own customer service representatives — Brick Spurio — is no exception! He’s been obsessed with making things go faster since then, and when racing season starts, Brick starts itching to get on the track. The owner of two Mustangs — an ‘87 GT, an ‘03 Mach 1, and always looking for more — Brick’s most recent quest for speed brought him to Reynolds, GA, home of the Silver Dollar Raceway and site of the 7th Annual Bassani Xhaust NMRA Ford Nationals. 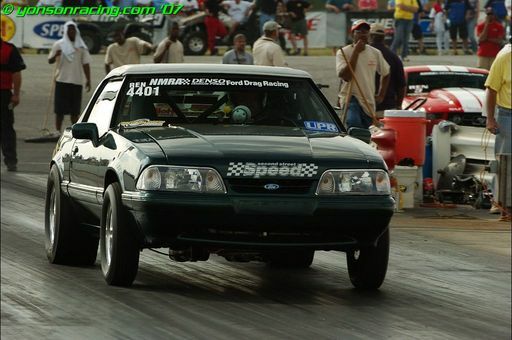 Though he wasn’t the driver in Georgia, Brick and his crew raced a 1990 Mustang LX Convertible, 7-UP Special Edition, which is show below. Driven by Chris Van Gilder, they won the first round against Bob Cook, only to lose by the slimmest of margins to Mike Roush in the second round. The official times are not available yet, but as soon as we have them, they’ll be posted! Brick and his crew will be in Milan, MI next for the 4th Annual Toyo Tires NMRA Ford Nationals! Look for the guy in the AmericanMuscle.com gear and be sure to say hi!